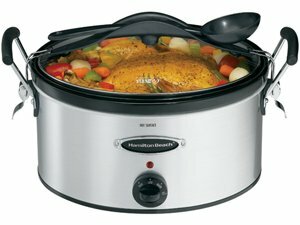 Hamilton Beach really dominates the slow cooker market, due to their practical approach to addressing the needs of their customer base. The company slogan is Good Thinking and it tends to show in products such as this model. Destined to be a workhorse in your kitchen, this slow cooker has a generous six quart capacity for feeding the largest family or social event. The controls are simple; a dial activates the cooker and controls the temperature. The finish is brushed stainless steel giving this a contemporary look, while the insert is glazed stoneware for even controlled heating. A glass lid tops this off. Both the insert and lid are dishwasher safe. The most novel and clever feature is the ability to securely fasten the lid down using attached clamps. This greatly enhances the security of bringing this along to potluck dinners and such without worrying that it could spill all over the car seat or trunk. The lid does a good job but doesn't completely seal the top so be mindful that thin liquids can still slosh out if you get all crazy with your driving. Large sturdy steel handles complete the portability package of this slow cooker. A spoon rest built into the handle is a clever feature, but more novelty than necessity, and prone to mess. While lacking the more sophisticated electronic controls of its brethren, this appears to be a solid performer in the kitchen, and the clamp-down lid wins points for practicality.